A list of must haves for babies with acid reflux, is a good item to have in order to make your infant as comfortable as possible. This can be most easily achieved with a variety of "helpers". Here is a list of must haves for babies with acid reflux that may help alleviate any symptoms. A Carrier or Sling - Most babies with acid reflux problems will benefit from being carried close to the parent's body in an upright position. These carriers help to recreate the soothing womb environment, which can be very comforting to a baby who is experiencing discomfort. There quite a few different carriers, so it's best to do some research to determine which kind of carrier is best for you. 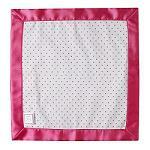 Swaddling Blankets - Another must have for babies with acid reflux. A child experiencing the discomfort of acid reflux may enjoy being swaddled. Although no special equipment is necessary to do this, many parents find it easier to use a blanket that is especially designed for swaddling, which is known as the "Ultimate Swaddle Blanket". A Lovey - Babies are comforted by their mother's scent. By placing a small, soft blanket inside your pajamas for several nights while you sleep, the scent will be transferred to the blanket. The blanket can then be used to comfort the child. To prevent the child from rolling down the wedge and ending up at the foot of the crib, most of these wedges include a harness that will secure the child comfortably and safely in place. The wedge will prevent the parent from rolling over onto the child. 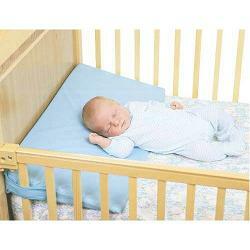 If the child is recommended to sleep on his or her stomach, this should only be done on an infant sleep wedge.